Long-Term Technical Outlook for Gold & Silver at Daily Gold. Gold’s performance in stock bear markets: Zeal. China and India account for half of world wide gold demand: Frank Holmes. So could “China’s problems be gold’s problems” at The Atlantic? Re-monetization of gold speculation: Does China Plan a Gold-backed Renminbi? at Gold Silver Worlds. …Silver breakout looks at Nifty Chart Patterns. 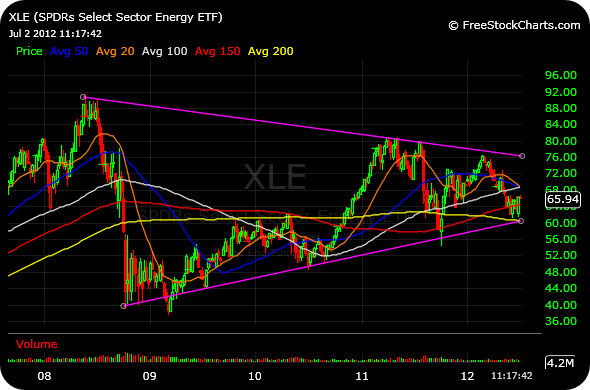 SLV breaking out: Kimble Charting Solutions. Gold finds itself near the end of a flag: Kimble Charting Solutions. Enjoy this Rick Rule interview over your lunch: King World News. This weekend everyone was excited over the coal stocks. The charts finally turned and started to improve: ACI, CLD and a chart-fest at FINVIZ. Got Coal? When “Less Bad” Starts To Work at Upsidetrader garnered a lot of attention. I was told Dan Fitzpatrick is high on coal. Am I too cautious in my patience? The ISA thesis continues to be to wait on natural gas. Looks like “U.S. natural gas prices must average in the $2.50 to $3.00 range” through shoulder season at Raymond James. Well productivity, associated gas production and the well-count backlog continue to keep natural gas supply high. Look for a turn later this year in the best natty supply read you will find: RBN Energy. Long term, ISA is in the super-cycle camp too. Japan is energy short (Washington Post). But not right now. Sinking coal prices force major job cuts in Australia at Mining. US thermal coal is the play, not coking coal. The China slowdown needs to end to turn around steel production (WSJ). This Motley Fool essay unintentionally shows Alpha Natural (ANR) to be in big trouble if met coal holds steady or heads lower. In the second quarter James River (JRCC) slashed capex to $5 million more than operating cash flow, and it was spun as positive (Barron’s). Ignored was interest expense being at over half cashflow alone. Who are they kidding? When the thermal market does turn, the capital starved players will lose out to the strong. One hundred twenty pages of gold fundamentals and charts: Erste Research. It’ll all be papered over, including Japan’s problems: Sober Look. The government debt maturity outlook has deteriorated significantly over the last two years: Acting Man. The Fed’s zero interest rate policy is theft from savers: Sober Look. Mexico hit a new record in gold production in 2011 (Mining). “Here’s a nice round-up of opinions from the analyst community on whether or not there will be QE3 this week.” Consensus: No QE3 This Week at Pragmatic Capitalism. Arguments for holding gold: Campbell Harvey. Another: “I don’t see a huge social cost to having a three or four percent rather than a two percent inflation rate.” Fool. Marginal Revolution. How rare are 1 million+ ounce gold deposits at Visual Capitalist. Decision time for gold continues to linger: All Star Charts. Silver resistance levels at Nifty Charts. Sprott is buying 7 million ounces: Mining. I would like to urge a patience with coal. I know the Internet is populated coal bulls who see marvelous opportunity in the small sector. Depressed valuations meet the industrialization of the third world. I am all over it. But slow down. China needs to regain momentum for the emerging market story. Met coal could be rolling over. And U.S. natural gas production needs to decline meaningfully, of which there has been no sign. Natural gas well completions are headed in the right direction (OGJ). Yet still more time is needed. Gas production has been held up by associated production (Me at SA), but Natural gas liquids hit dry patch as prices sink (Fuel Fix) is a good thing. Bakken natural gas production figures to be big (Dickinson Press). If the children of my dear friends in the Philippines are to enjoy a better life, then this chart is accurate: API. Arch Coal (ACI) reported second quarter results and held their conference call this morning. The financial leverage stands out: First half interest expense was $150.5 million against EBITDA of $361 million. Whow! But their next maturity is not until 2016. ACI is higher by 19%, back to Tuesday’s price level. Despite yesterday’s EIA oil report showing an increase in inventory, the price reversed higher. Bloomberg New oil sands development requires a very high oil price: Financial Post. “A new study says North Dakota’s oil production could jump more than threefold by 2025 to more than 2 million barrels a day.” (Dickinson Press) “Production there averages around 800,000 barrels per day.” (Oil Price) Meanwhile, “Eagle Ford crude production is close to 600 MB/d.” (RBN Energy) That gets us to 1.4 million barrels per day between only the Bakken and Eagle Ford and heading higher. The shale story is being underestimated! A map showing IEA country strategic oil reserves: Business Insider. Is Natural Gas Going To $4.00? Not before winter! But enjoy the chart-fest: Globe Trend Capital. S&P 500 chart technically ‘looking blurry’: Chartology. Commodities reaching a “Counter Trend Peak” and about to fall once again? Deflation trend going to continue? Kimble Charting Solutions. Here at Independent Stock Analysis we inform and educate. Perhaps you find ISA a great productivity tool. You are a big boys. I don’t shout at you do something. What you won’t find here: Anatomy of A Vancouver / OTC Penny (PAID) Stock Promotion. Gold up $32 as QE3 drumbeat grows louder at Mining. Now they are talking ‘open-ended’ QE: Economist. Monetary madness in the Wall Street Journal at Economic Policy Journal. Anatomy of Future Gold & Silver Bubble at Daily Gold. Is GLD safe? Precious Metals ETF Alchemy GLD – the new CDO in disguise? from Hinde Capital. 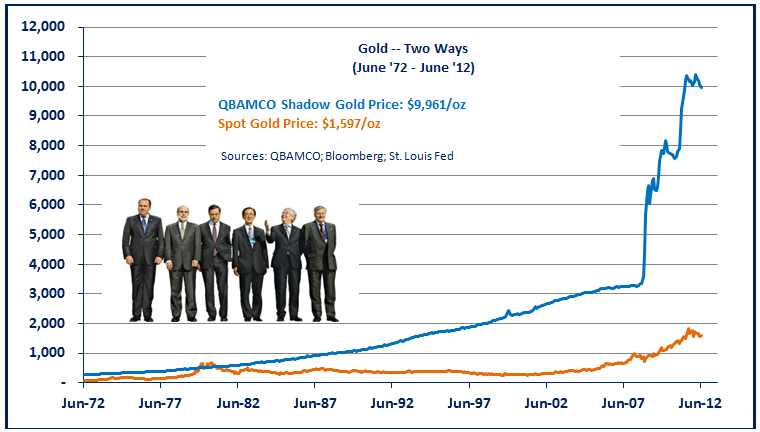 Corrections in gold since the beginning of the bull market: Gold Money. Gold Gearing to Breakout: Dragonfly. The Golden Triangle: Robert Sinn. Gold implied volatility by Robert Sinn. Gold next to other asset classes from Gold Money. Oil and gold seasonality at Zero Hedge. “The number of Chinese online was already huge, and it’s soared over the past year by more than 50 million thanks to an upsurge in mobile Internet access.” CNET “…800 million to 1 billion new consumers around the world will enter the middle class this decade…” Peter Pham. The credit bubble may have begun a blow-off top. Leadership has narrowed to US Treasury’s and German Bunds, and investment grade corporates (Bespoke). The Swiss 5-year has gone negative (Sober Look). Meanwhile, spreads are rising (Bespoke). Note “bond prices in free fall” at Reuters. The financial crisis was entered with government and corporate balance sheets in good shape, while the consumer was a wreck. The next crisis will occur with business and the improved consumer (Housing Views) much better off than governments. Highlights of Ray Dalio’s Q2 Bridgewater letter: Business Insider. Essential facts about the Federal budget: WSJ. Richard Russell bullish on housing at Financial Sense. Chart-fest by Peter Brandt. “The U.S. economy is downshifting, even as the housing sector is finally showing signs of life.” WSJ Optimism from the Economist. Housing supply is tight with with inventory is down 24.4% year over year (Calculated Risk). More color: Marketwatch. Builder confidence has rebounded (Carp Diem) and the stocks have had a party (Bespoke). Thoughts from some fellows at the New York Fed. Shadow inventory improvement from Economic Musings. The anecdotal stories never end: Sacramento, Michigan and Chicago are strong. San Antonio prices are at new all-time highs. Housing picking up would help Dr. Copper, which has been hanging around $3.50 a pound (Mining). These prices are not enough to spur supply (FT). Yet they’ve made balance sheets strong (SA). Copper chartology. Jeff Saut at KWN: “I expect notional world GDP growth going forward to be somewhere around the 4% level.” If he’s even close, think commodities as represented by the CRB at Ritholtz. Commodity Prices Will Continue to Ratchet Up by Greg Harmon. Corn at $12.50 is possible by Peter Brandt. A Euro rebound is bullish as are these black candlesticks. The S&P 500 is right at resistance. 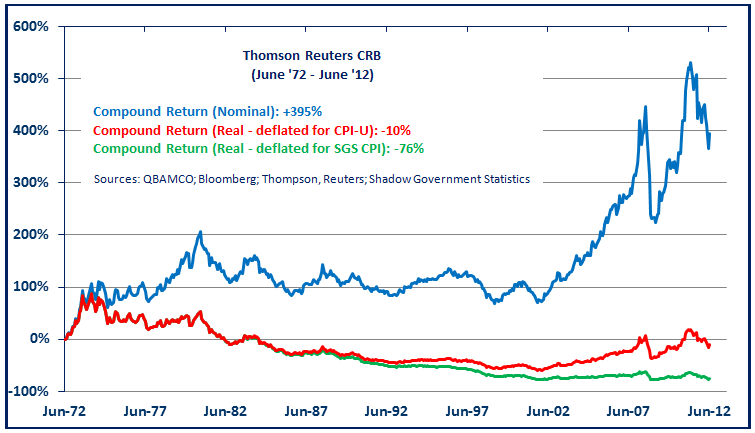 Note this chart of credit adjusted gold from Real Return Investing at Ritholtz. This piece might be the most worthwhile read of the week. Meanwhile, the gold miners are still stuck in the mud: Market Anthropology. Gold Stocks are due for a “Bounce!” Is a 30-year under-performance long enough? at Kimble Charting Solutions. The gold price direction: Peter Brandt. Rick Rule on the tightness in the physical silver market: King World News. Is Silver about to rally 10%? at Kimble Charting Solutions. This silver chart is the largest symmetrical triangle I have ever seen: Nifty Charts. Europe Runs Over the Platinum Price at WSJ. Crude Trades Near Seven-Week High on Iran Tensions, Stimulus Speculation at Bloomberg. Fragile, but Comfortable, Oil Market Expected at Oil Price. Chinese crude imports at nine-month low at CGES. What happens to price if and when imports re-accelerate? Natural gas supply remains stubbornly high at the EIA, but look at the Haynesville rig count for a clue to the future: Haynesville Play. More on Japan and the spot LNG market: Energy Tribune. CRB and WTI technical analysis: Robert Sinn. Pretty much all the producers are very undervalued under decent oil and gas pricing regimes. MHR’s reserve report at Benzinga. Oil Trades near One-Week High on Bets China Will Boost Economy at Bloomberg. U.S., Canada to drive 2013 non-OPEC oil supply gains at Fuel Fix. But this is getting carried away: “the US should collaborate with Canada and Mexico to not only fulfill domestic needs but make North America the world’s largest energy supplier” at AOL Energy. IEA sees modest oil demand increase in 2013 at the Oil and Gas Journal. The CRB is The Most Important Chart for Friday at Stock Sage. While This Is The China Chart To Watch at All Star Charts. Meanwhile, the dollar does not seem to matter: Kimble Charting Solutions. Devaluing the Pound Isn’t a Solution, It’s Default yet they’ll do so anyway: Bloomberg. Gold mining stocks opportunity at Forbes. Chartology: Gold Price Near Important Resistance at See It Market. Chartology: Silver Bounces Off Critical Support also at See It Market. Oil Rebounds in New York on Global Stimulus Speculation, Iran at Bloomberg. The especially weak ISM manufacturing data yesterday was bullish, in a perverse way, because of a pavlovian market participant response to central bank easiness expectations. It starts Thursday with the ECB at Business Insider. Depressed commodity prices clear the path (Bespoke). Stock futures are flat this morning, but commodities are higher, perhaps as currency substitutes and not on their fundy’s alone (Globe and Mail). The Canadian rig count collapses into fall and spring and rebounds into summer and winter based on the ability to travel and drill in remote areas. This summer isn’t not seeing much of a return to drilling, based on price: Energy Digger. It’s not a btu short world. However, worldwide crude production will not meaningfully go higher: Russ Koesterich. A bear case for oil: Econmatters. Natural gas liquids at Econbrowser. NGL’s and propane: RBN Energy. Worthwhile Marcellus information is in this article, once the reader gets past some political ideologies: Examiner. Directly related are Eagle Ford well starts: EIA. Details on the Mississippi Lime have been hard to find to this point: E&P. U.S. April 2012 crude production was down 5% from March, yet up 10% over April 2011: EIA. Booming production and declining demand means U.S. net petroleum imports were down 15% April over April: EIA. U.S. Rig Count: -7 (all Gas Rigs) to 1,959 at Haynesville Play. This heat sure is helping burn off the excess natty in storage, meanwhile Cities That Wouldn’t Exist Without Air Conditioning at Atlantic Cities. Canada’s natural gas dreams closer to reality after Petronas moves at the Financial Post. No Energy Yet in the Energy Sector: Dragonfly. Earnings, Meet Cliff: Energy’s Contribution to S&P 500 Earnings Is Plummeting, the Raymond James Energy Stat of the Week. I was published at Seeking Alpha: Forest Oil: A Speculative Idea.